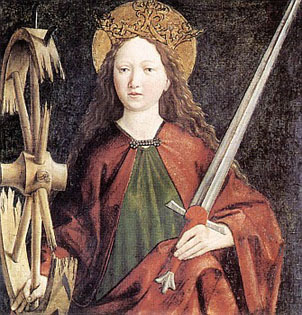 Today is the Feast of Saint Catherine of Alexandria, also known as Saint Catherine of the Wheel, patron – among other things – of scholars, students, philosophers and theologians. 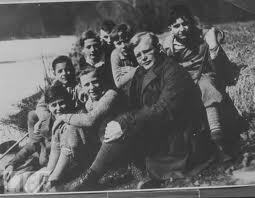 Although one would not normally associate the practice of theology with an act of martyrdom, we have a theologian here to consider whose death at the hands of his Nazi jailers was a kind of martyrdom, a death in any case fitting for a witness to the theology he was not simply content to think out, but actually committed himself to live out. But first, let us divert somewhat. We have been silent witnesses of evil deeds; we have been drenched by many storms; we have learnt the arts of equivocation and pretence; experience has made us suspicious of others and kept us from being truthful and open; intolerable conflicts have worn us down and even made us cynical. Are we still of any use? What we shall need is not geniuses, or cynics, or misanthropes, or clever tacticians, but plain, honest, and straightforward human beings. Will our inward power of resistance be strong enough, and our honesty with ourselves remorseless enough, for us to find our way back to simplicity and straightforwardness? These words, which seem to me could have been spoken just the other day, were the words of the prisoner Dietrich Bonhoeffer (Letters and Papers from Prison, Touchstone, 1997), pastor of the Lutheran Church in Germany, written some sixty-six years ago prior to his execution at dawn by hanging on April 9, 1945. Due to his involvement in a plot to assassinate Hitler, this sentence to hang by the neck until dead brought with it the added requirement that it be in fact a slow death by strangulation, which the use of piano wire consequently assured. 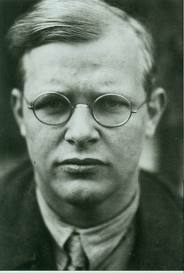 A brilliant Protestant theologian as well as profound, Bonhoeffer stressed piety, both personal and collective, reviving the idea of the imitation of Christ. Christians should not retreat from the world, he stressed, but act within it. Believing that two elements were part and parcel of faith, the practicing of justice and the acceptance of divine suffering, he made it a point that the Church, like every Christian individually, “had to share in the sufferings of God at the hands of a godless world” if it were to be true to itself as the mystical body of Christ. With Nazi ascension to power in January of 1933, Bonhoeffer became an open and active opponent of the regime from the very beginning, delivering a radio address in which he attacked Hitler only two days after Hitler was installed as Chancellor. In this address he warned the people of Germany against falling into an idolatrous cult of the Führer (leader), who could easily reveal himself to be in reality Verführer (mis-leader, or seducer). Not surprisingly, he was cut off the air in the middle of a sentence. In April, he spoke out against Hitler’s persecution of Jews, declaring that the Church must not simply “bandage the victims under the wheel, but jam the spoke in the wheel itself”, his voice the first and, as it turned out, virtually the only voice to call upon the Church to resist the regime. The second form, Weil explains, is demagoguery, which the Nazis were well-suited to exemplify, just as the leaders of the War on Terror are well-suited to exemplify in our day. Clearly Bonhoeffer was not one of those “honest” people Weil was referring to who tell lies. He knew what he was doing, he knew what he was saying. 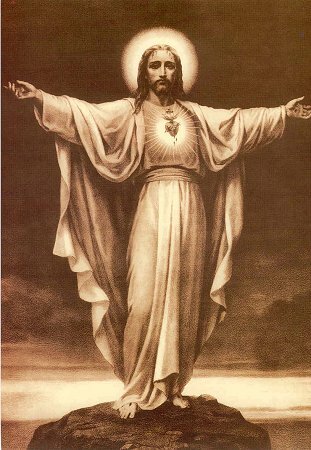 His honesty was like that of any saint, in that he had a profound awareness of his own sin together with a profound feeling for the suffering of others, a feeling that he saw from the depths of his soul as the sufferings of a loving God at the hands of a godless world. 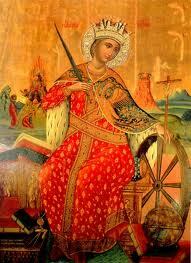 As mentioned at the start, today is the Feast of Saint Catherine of Alexandria. Raised a pagan, she converted to Christianity in her late teens. The legend tells that around 305 she visited her contemporary, the Roman Emperor Maxentius, with a view to convince him of the wrongfulness of his persecution of Christians. Although she did not manage to win him over, she did succeed in converting his wife the Empress, along with many pagan philosophers whom the Emperor sent to dispute with her, all of whom were subsequently martyred. As the Emperor could not convince Catherine to abandon Christianity, he imprisoned her. 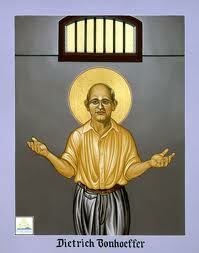 It was because the people who visited her kept converting that she was condemned to death on the “breaking wheel”. This was (however often it may have been used in the Roman era) a fairly common device of torture used for capital punishment in the Middle Ages and early modern times for public execution by cudgeling to death. According to the legend, the wheel broke when Catherine touched it. Therefore she was beheaded instead. Both in their different ways, Dietrich Bonhoeffer, theologian, and Catherine of Alexandria, patron of theologians, jammed a spoke in the wheel of official oppression. We can earnestly ask who in our day will witness to the sufferings of God in this Godless world. Who will, as official lies become more blatant, as governmental global surveillance and policing become more onerous, as by official economic policy the super-rich become ever richer and as everyone else becomes ever poorer, not simply bandage the victims under the wheel as the churches are wont to do, but will prove to be martyr enough to jam the spoke in the wheel itself, in that breaking wheel, that Emperor’s wheel and Führer’s wheel, of the coming official, world-wide oppression? As the One, Holy, Catholic, and Apostolic Church begins in our time to share in the sufferings of God at the hands of a godless world – who? The C.C. priest this month did talk a little about the lack of work here and the difficulties we are all facing as to finances because of this. The activity that was offered was to do something so the world of spirit can help, even if it means volunteering. I totally agree with what he said, but yes, this is somewhat a bandage as you described which is a liberal attitude of mind. Those that do push bach, even if it means through education, as did St. Cathrine, are threatened as well as their whole family and all who financially support them. People are like sheep, in the face of 2 evils they will choose the one they think is the lessor evil against their personhood. It is the parable of the gold in the field, they are the gold, but they bury it and buy into the dirt of the field in which it is buried to keep it safe so they do not have to be concerened. Maybe they should start reading 2 fairy tales, Rumplestiltskin and another that a friend asked me what it meant, which is Hans Married. I asked 3 questions to understand this fairy tale, Where is the Father?, Who is the Uncle? The meaning of the hot stove? And immediately the meaning came, it is profound and we all must understand what this means for us today especially since the C.C. priest said that most people today are atheists. 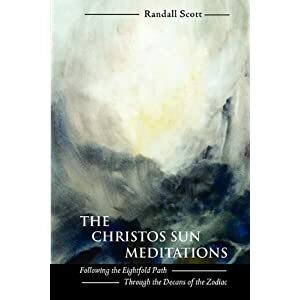 There are some things that Rudolf Steiner said that I remember not because I understood them at the time but that I wanted to understand what he meant by it, and that is that is of the materialisation of the spirit. What is happening at every airport is an act of Battery against the person and this is a Felony and no one should summit to it, and to let them know this goes against Article 1 Sect.8, last part of Clause 18 , against our 4th Amendment Right. They actually can not do what they are doing legally outside of the 10 mile raidius of DC. And as a friend said, if the airline will not let you on the plane after refusing this assult “just tell them that you will sue the snake snot out of them”. As a dear friend of mine once said, “Who has more fun than Hue-man s. We need a sense of serious humor today in the face of all that is happening. It is Thanksgiving here and I wish you much Gratitude for your work.